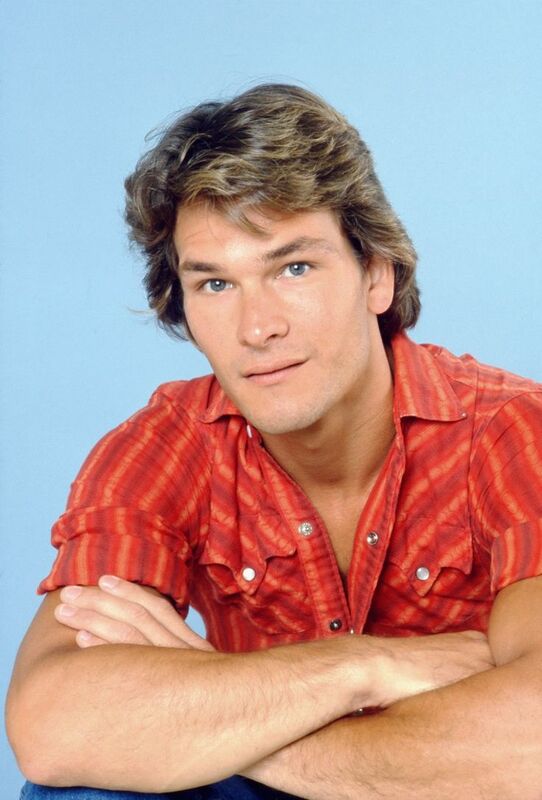 Portrait of Patrick Swayze. Image available on the Internet and included in accordance with Title 17 U.S.C. Section 107. 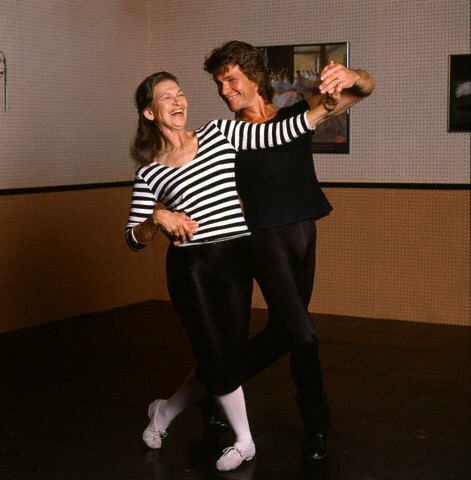 Patrick Swayze and his mother, Patsy, dance together. Image available on the Internet and included in accordance with Title 17 U.S.C. Section 107. Patrick Swayze and Lisa Niemi dance with Patsy Swayze at her dance studio, 1978. Courtesy of Tom Colburn and the Houston Chronicle. Image available on the Internet and included in accordance with Title 17 U.S.C. Section 107. At Waltrip High School, Swayze began focusing on athletics—balancing swimming, diving, gymnastics, track, and football. In fact, he excelled on the gridiron and had aspirations of earning a college scholarship until a knee injury his senior year cut his hopes short. Swayze nevertheless received a scholarship to San Jacinto College for gymnastics and worked all spring and summer to get back in shape. In 1971 he entered college with dreams of competing in the Olympics and for the interim took a job managing the skating rink at the Houston Galleria. But his hopes were dashed when he once again injured his knee and needed more surgery and another cast. He attended college one more year until accepting an offer to tour with the Disney on Parade ice show as Snow White’s Prince Charming. Throughout this time Swayze had been forming a relationship with future wife, fifteen-year-old Lisa Haapaniemi (Niemi), a student at his mother’s ballet company, Houston Jazz Ballet. After the Disney tour, he received a ballet scholarship to Harkness Ballet in New York City and left eager to begin a serious career in dance. After Niemi graduated high school, she joined Swayze at Harkness. The couple married on June 12, 1975, in Houston, holding their reception at Swayze Dance Studio. When Harkness later folded, Swayze got the chance to dance with the prestigious Elliot Feld Ballet. His knee, which required regular draining, however, would soon put an end to his aspirations of being a professional ballet dancer. He was devastated but still “had performing in his blood” and began taking acting lessons. Swayze and co-star April Allen in Skatetown, U.S.A., 1979. Courtesy of Getty Images. Image available on the Internet and included in accordance with Title 17 U.S.C. Section 107. Still from The Outsiders, 1983. Courtesy of Getty Images and the Huffington Post. Image available on the Internet and included in accordance with Title 17 U.S.C. Section 107. Patrick Swayze and co-star James Read dressed as confederate soldiers in North and South, circa 1986. Courtesy of ABC and the Los Angeles Times. Image available on the Internet and included in accordance with Title 17 U.S.C. Section 107. Dirty Dancing Poster, 1987. Image available on the Internet and included in accordance with Title 17 U.S.C. Section 107. 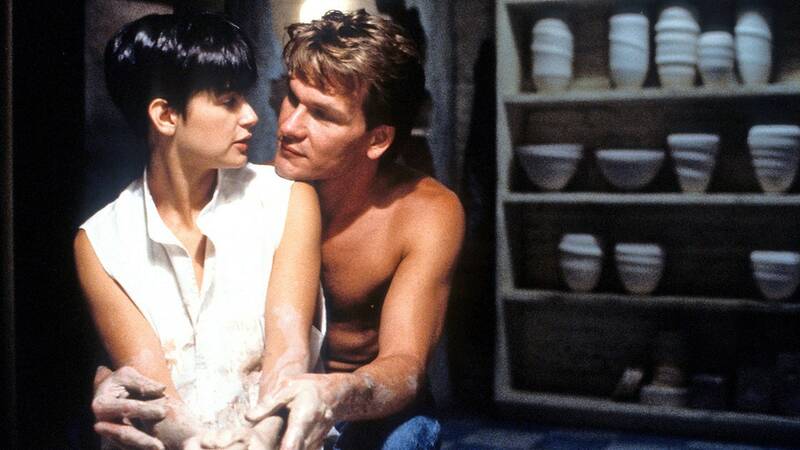 Still from Ghost, 1990. Courtesy of Archive Photos/Moviepix/Getty Images. Image available on the Internet and included in accordance with Title 17 U.S.C. Section 107. 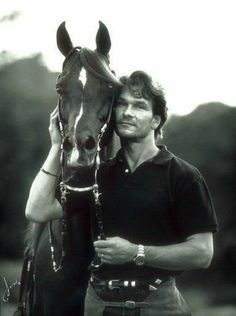 Patrick Swayze with one of his horses. Image available on the Internet and included in accordance with Title 17 U.S.C. Section 107. Up until this point, Swayze had avoided taking roles that would cast him as a dancer or teen idol, but along came Dirty Dancing (1987). He and his wife saw something of real potential in this script about class conflict and coming-of-age in the 1960s, yet nobody could expect the level of success the small-budget film would achieve. Swayze starred as the working-class dance instructor employed in a country club-type setting opposite actress Jennifer Grey’s debutante. The final dance scene, set to the song, “(I’ve Had) The Time of My Life,” went down in film history, as well as the famous line Swayze uttered, “Nobody puts Baby in a corner. ”Also of success, was the song “She’s Like the Wind” that Swayze co-wrote and performed for the soundtrack, which quickly made its way up the Billboard chart. Per poor initial reviews, Dirty Dancing was on track to be sent straight to video or canned, but instead the film made more than $10 million in its first ten days, a remarkable sum for the time. Other less noteworthy roles followed, including two action films, Road House (1989) and Next of Kin (1989). In 1990 Swayze rose to the top again with another romantic lead. This time, he played Demi Moore’s dead fiancé consulting with a psychic, played by Whoopi Goldberg, to communicate with the living in the Academy Award-nominated movie Ghost. The following year he was voted People magazine’s “Sexiest Man Alive.” He liked to keep his audience on their toes, so for subsequent roles he chose to transform himself into a beach bum in Point Break (1991), a drag queen in To Wong Foo, Thanks for Everything! Julie Newmar (1995), and Pecos Bill in Disney’s A Tall Tale (1995). In 1992 Swayze was upset when he did not receive the critical reception he had hoped for from the film City of Joy, in which he played a doctor working in India’s slums. He had been deeply moved by the experience of researching the role, and its mediocre reviews brought up feelings of inadequacy. By this time, his drinking problem had worsened and his marriage was suffering. Then in 1994, his sister Vicky committed suicide. Finally seeing his life spinning out of control, Swayze entered rehab for treatment. For awhile he retreated from Hollywood and spent time at his properties in California, New Mexico, and Texas with his horses, cats, dogs, and peacocks, but soon returned to work. The Swayzes flying their plane. Courtesy of the Daily Mail. Image available on the Internet and included in accordance with Title 17 U.S.C. Section 107. One Last Dance Poster, 2003. Image available on the Internet and included in accordance with Title 17 U.S.C. Section 107. This would not be the end of his setbacks, however. While filming Letters from a Killer (1998), Swayze suffered a near-catastrophic accident when he was pitched into a tree by a horse he was riding. He broke both of his legs—his right femur completely in half—and tore tendons in his shoulder. After a period of recovery, he returned to the screen, but in 2000 Swayze, a licensed pilot, had another brush with death when the plane he was flying experienced a pressurization problem. At first, many thought that he was intoxicated, but an investigation proved otherwise. He had begun to suffer the effects of hyperoxia, was completely unaware that his plane had been off course, and had nearly crashed several times. Reaching a lower altitude, he awoke just in time to land the plane in a housing complex that was under development. Still from The Beast, 2009. Image available on the Internet and included in accordance with Title 17 U.S.C. Section 107. In the early 2000s he starred in a string of films including Forever Lulu (2000), Waking Up in Reno (2002), and One Last Dance (2003), a movie for which his wife wrote, directed, and acted. In his last years, his career began to take another upturn. He made a cameo as a dance instructor in the follow-up to Dirty Dancing called Dirty Dancing: Havana Nights in 2004, and in 2006 he made his West End of London debut in Guys and Dolls. His part in the cult classic, Donnie Darko (2001), in which he played a motivational speaker with a dark secret, led to roles in other independent films, including 11:14 (2003) and Jump! (2007). It was for these movies that he finally achieved serious praise for his acting. Then in 2009, he starred as a FBI agent in the A&E television series, The Beast, garnering the best reviews of his career. 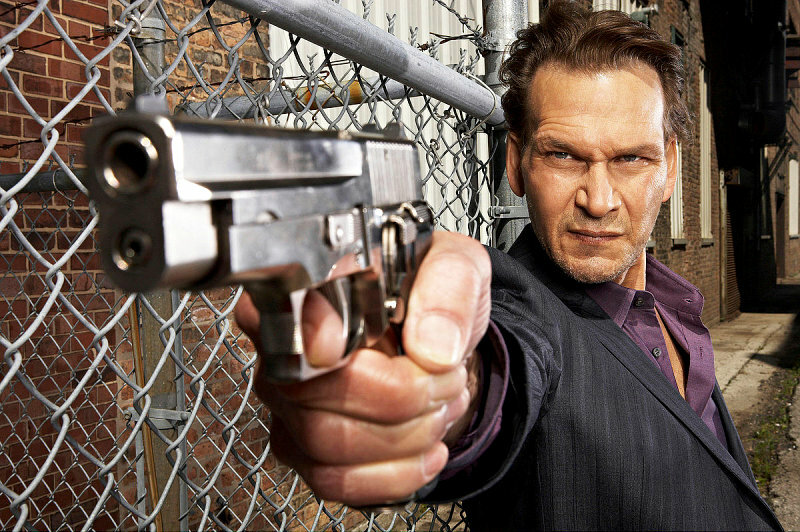 His final film, Powder Blue (2009), was the first in which he acted alongside his brother, Don Swayze. Patrick Swayze speaks on the Stand Up to Cancer telecast, 2008. Courtesy of Getty Images. Image available on the Internet and included in accordance with Title 17 U.S.C. Section 107. In January 2008 Swayze faced his greatest challenge yet, a diagnosis of Stage IV pancreatic cancer. He filmed what was to be his last work while going through grueling chemotherapy treatments, shunning painkillers as to not dull his performance. In September 2008, he appeared on a multi-network telecast, Stand Up to Cancer, promoting cancer research. He received a standing ovation. Then in January 2009 Swayze did an interview with Barbara Walters in which he detailed his optimistic battle with the disease and admitted that his cigarette habit likely “had something to do with” its development. Soon after he was hospitalized with pneumonia and received the news that the cancer had spread to his liver. Swayze died on September 14, 2009, at the age of fifty-seven, twenty months after his diagnosis. Swayze's autobiography, The Time of My Life, 2010. Image available on the Internet and included in accordance with Title 17 U.S.C. Section 107. The Swayzes and their dogs at their ranch in New Mexico, 2009. Courtesy of Brian Braff/AP Photo. Image available on the Internet and included in accordance with Title 17 U.S.C. Section 107. After his death, Swayze’s autobiography, The Time of My Life, written with his wife, was published. In it, Swayze detailed his love for horses which, like performing, he said, was in his blood. His paternal grandfather was a foreman at the King Ranch before being shot to death by cattle rustlers, and Swayze stated he was more like his father, a champion rodeo cowboy who “wore his heart on his sleeve,” than his highly-driven mother, although he owed his talent to both. He regretted not having children of his own to share his dreams with, but said, in a way, his love for his animals and land fulfilled that desire. Swayze requested his ashes be spread at his ranch in New Mexico under a favorite mountain. "Actor Patrick Swayze Dies at 57," CBS News(http://www.cbsnews.com/stories/2009/09/14/entertainment/main5310962.shtml?tag=cbsContent;cbsCarousel), accessed December 1, 2010. New York Times, September 15, 2009. "Patrick Swayze on Stand Up to Cancer: DREAMING OF A CURE," People Magazine, September 22, 2008 (http://www.people.com/people/archive/article/0,,20230576,00.html), accessed December 1, 2010. 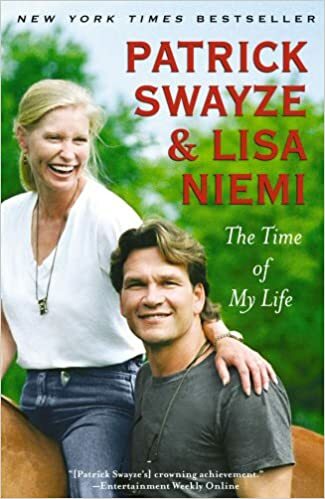 Patrick Swayze and Lisa Niemi, The Time of My Life (New York: Atria Books, 2009). Handbook of Texas Online, Kassie Dixon, "SWAYZE, PATRICK WAYNE," accessed April 26, 2019, http://www.tshaonline.org/handbook/online/articles/fsw35. Uploaded on December 17, 2010. Modified on July 10, 2017. Published by the Texas State Historical Association.